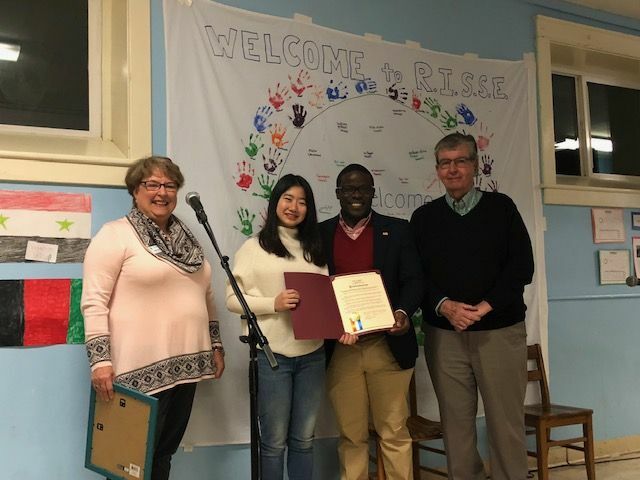 Stella R. '19 was recently recognized by the Refugee and Immigrant Support Services of Emmaus (RISSE) Center in Albany, NY for her outstanding dedication to the after-school program. For her junior and senior year, with the support of Emma Willard School's Signature and Service Learning programs, Stella conducted weekly art classes for many of the children who attend the center’s after-school program. The main goal of her project was to help to increase confidence and self-worth in the children from refugee and immigrant families in the Capital Region. In conjunction with the project, Stella has used the children's artwork to create items such as mugs, tote bags, and notebooks to sell as a fundraiser for the RISSE Center. Through this initiative, she raised over $3,000 to go toward RISSE's "Give Kids a Lift" fund which is raising money to purchase a van for transporting participants to and from the center. Cheryl Lasher, director of development at RISSE; Councilman Owusu Anane of the Pine Hills district of Albany, and New York state Senator Neil Breslin recently presented Stella with a certificate of recognition for her hard work. Congratulations, Stella! The public will have an opportunity to view the artwork of the children from the RISSE Center in January. Stella’s exhibition, “Paining Inspiration,” will be on view at The Arts Center of the Capital region from January 14 – February 22, with an opening reception on January 25 from 6-8 p.m. Learn more about Stella’s Signature project and follow her progress on her blog.